A street sweeper follows a parade led by Aryan Nation's leader Richard Butler, riding in car with a megaphone, in Oct. 2000, in Coeur d'Alene, Idaho. Butler filed for bankruptcy shortly afterwards, days before he was to give up his 20-acre compound. Wayne Jones of Twin Falls, Idaho, stands guard at the main entrance to the Aryan Nations Church compound in Hayden Lake, Idaho in 1989. The white supremacist church hosted a neo-Nazi conference to mark the 100th anniversary of the birth of Adolf Hitler. People gather to march out of Coeur d’Alene, Idaho, April 22, 1989 to protest against a nearby neo-Nazi skinhead conference being held at the white supremacist Aryan Nations Church compound in Hayden Lake. Aryan Nation members march during their annual parade in Coeur d'Alene, Idaho, Saturday, July 7, 2001. Reflecting how far the Aryan Nations has fallen since losing a $6.3 million civil rights lawsuit, only a small number of people marched in the parade. A worker moves children's play equipment from the former headquarters of the neo-Nazi Aryan Nations in May of 2001, near Coeur d'Alene, Idaho. Internet millionaire Greg Carr decided to destroy the buildings and celebrate human rights at the 20-acre site. Civil rights attorney Norm Gissel smiles as he talks about the imminent dismantling of the former headquarters of the Aryan Nations in May 2001, in Hayden Lake, Idaho. Behind Gisel is a Nazi insignia painted atop the roof of the compound's cafeteria. It didn’t take him long to manifest his dream of a “white homeland” in Kootenai County. Richard Butler, an aeronautical engineer, moved with his wife, Betty, from California to Hayden Lake, Idaho in 1973. 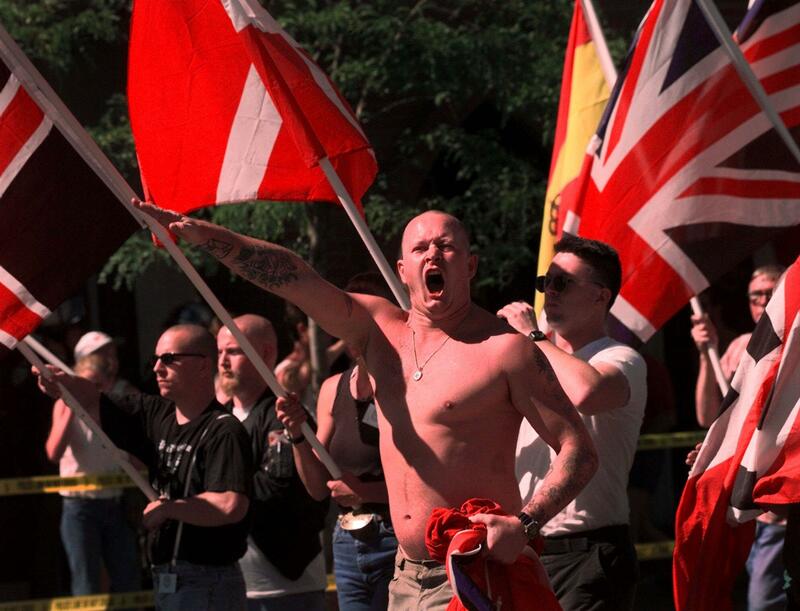 Karl Wolf raises his arm in a Nazi salute as he marches through the streets of Coeur d'Alene, Idaho in 1998. Scores of police in riot gear stood between hundreds of protesters and onlookers as about 90 members and supporters of the Aryan Nations marched. Nestled among trees of the north Idaho countryside, Butler established the Church of Jesus Christ Christian four years later, along with the Aryan Nations, his infamous group that eventually drew more than 100 white supremacists to north Idaho each year to promote his message of hate and intolerance. Others heard that call and flocked to learn more about Butler – those like Robert J. Mathews. Eventually, Mathews and others splintered off from Aryan Nations, forming a violent faction known as The Order. 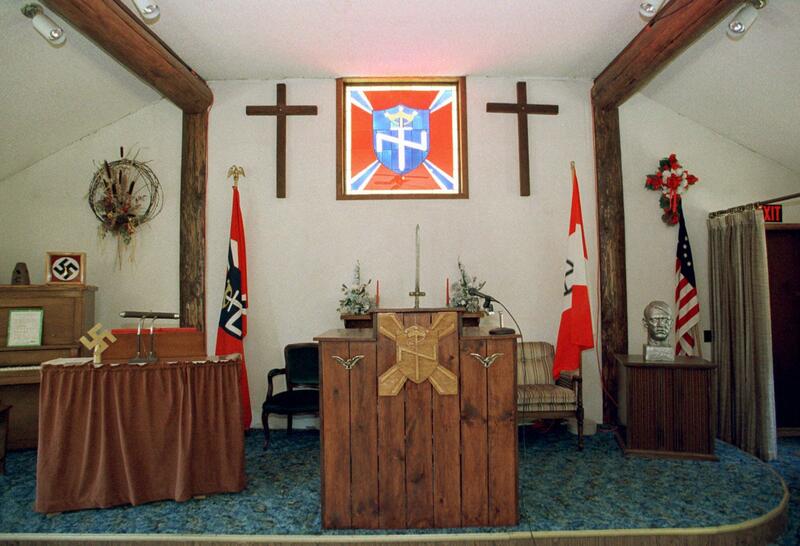 The interior of the Church of Jesus Christ Christian-Aryan Nations on the group's compound north of Hayden Lake, Idaho in 2000. A federal court found members of this new group assassinated a Denver-based, Jewish radio host, bombed a synagogue, robbed banks and stole millions from armored cars during the 1980s before Mathews burned to death during a shootout with FBI agents at Whidbey Island, Washington. None of this could be pinned on Butler, nor was he convicted of a charge from 1987 in Arkansas that accused him of trying to overthrow the government. Aryan Nations gatherings eventually spilled over onto the streets of nearby Coeur d’Alene, with the parade of blood red Nazi flags contrasting the cerulean blue lake a few blocks away from Sherman Avenue. A death rattle would soon be heard, though. 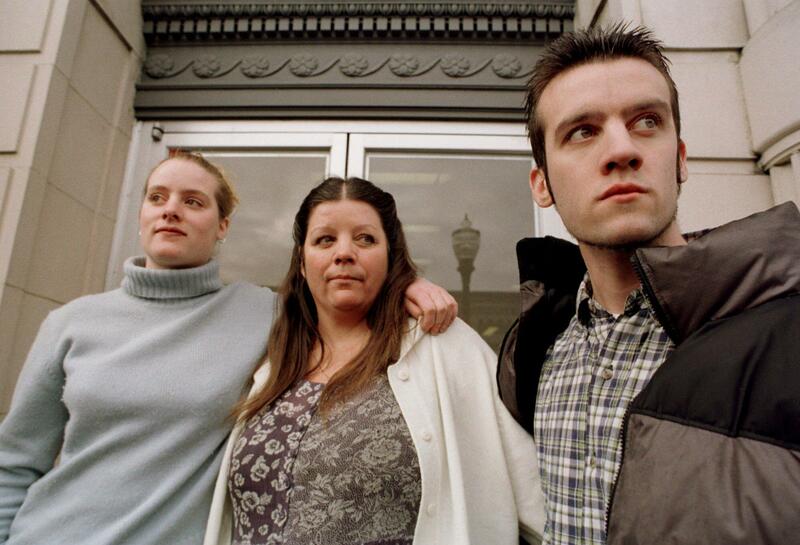 Victoria Keenan, center, her son Jason Keenan, right, and her daughter Sarah Keenan, left, stand on the steps of a federal courthouse, in 2001, in Coeur d' Alene, after Victoria and Jason took possession of the Aryan Nations headquarters and its contents. Armed guards at the Hayden Lake compound shot at Victoria Keenan and her son, Jason, one night in 1998. Guards claimed they heard gunshots coming from the direction of the Kennans’ car. They eventually forced the mother and son into a ditch and assaulted them, according to the Southern Poverty Law Center, which took up the Keenans’ case. The family won a $6.3 million judgment against Butler and others in court, which came in the form of the 20-acre compound. 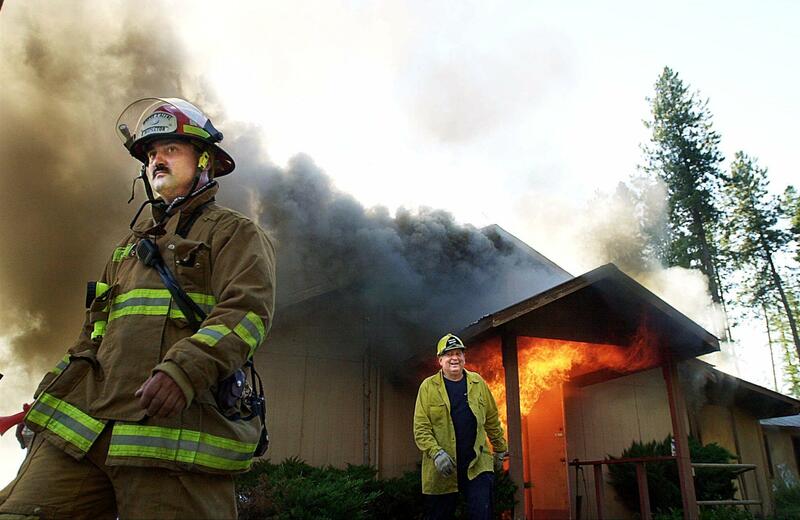 Firefighters from northern Idaho and eastern Washington participate in unique fire training Wednesday, July 11, 2001, climaxing with the destruction of the church structure at the former Aryan Nations compound in Hayden, Idaho. The guard tower, church and several other buildings were dismantled – many were burned in training exercises conducted by local fire departments. It’s now owned by North Idaho College, which turned the property into a “peace park” in an attempt to radiate a brighter message than the one of hate that persisted for decades. Butler later lived in a house purchased by one of his followers and continued his white supremacist rallying cry -- this time through the internet. He campaigned for mayor of Hayden in 2003, but lost by thousands of votes, according to the New York Times. He died of natural causes the following year. This story is part of KBSX's news series "Legacy Of Hate." Edgar Steele, who once represented Aryan Nations founder Richard Butler in a lawsuit that bankrupted the white supremacist group, has died in federal prison in California. Steele was 69. Steele was serving a 50-year sentence at the federal prison in Victorville, California, after he was convicted of plotting to kill his wife. The prison website listed him as dying on Thursday. No other details were immediately available. Human rights advocates in north Idaho don’t expect a white supremacist to get very far in his bid for sheriff. Shaun Winkler is a candidate in the Republican primary for Bonner County’s top law enforcement office. Winkler’s critics say the best strategy is to ignore him.